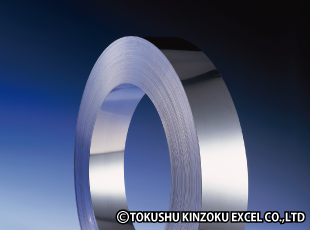 TOKKIN™ 350│Precipitation Hardening Stainless Steel for Bellows | TOKUSHU KINZOKU EXCEL CO.,LTD. TOKKIN™ 350 is a precipitation hardening stainless steel with excellent yield strength and cyclic fatigue strength. Compared to other stainless steels, it has better weldability, corrosion resistance, and oxidation-resistant properties. TOKKIN™ 350 corresponds to JIS SUS633, and is a chromium–nickel–molybdenum stainless steel. It has excellent workability when solution heat treated or annealed, and boasts high strength when heat treated. It also has excellent yield strength and cyclic fatigue strength. How is TOKKIN™ 350 different from other precipitation hardening stainless steels? Thanks to a higher Mo content than other precipitation hardening stainless steels (SUS631 and SUS632J1), TOKKIN™ 350 has excellent corrosion resistance and oxidation-resistant properties against sulfuric acid, hydrochloric acid, and other substances. It does not contain aluminum or titanium, which gives it excellent weldability. For this reason, TOKKIN™ 350 is frequently used in applications requiring long life such as bellows, actuated valves for air conditioners, and diaphragms for cooling equipment. Note:The 4-level rating scale is intended for comparative purposes only. Corrosion testing is recommended; factors which affect corrosion resistance include temperature, concentration, pH, impurities, aeration, velocity, crevices, deposits, metallurgical condition, stress, surface finish and dissimilar metal contact. To ensure high hardness, TOKKIN™ 350 is annealed and then precipitation hardened. This process involves a primary hardening treatment, which transforms the metastable austenite structure into a martensite structure, and a precipitation hardening treatment, which completely hardens the material. TOKKIN™ 350 can be hardened using the SCT850 heat treatment conditions shown in the diagram on the right. SUS631/632J1 and TOKKIN™ 350 are cold rolled and then precipitation hardened. This process forms an intermetallic compound containing minute amounts of aluminum in the martensite, which enables these materials to achieve extremely high hardness.